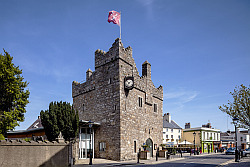 Dalkey Castle & Heritage Centre is comprised of the 14th century Fortified Townhouse/ Castle, the Early Christian Church, dedicated to St Begnet, and the modern Heritage Centre. Dalkey Town Hall built in 1893 is accessed through the Castle foyer. St Begnet’s Church & Graveyard is also accessible through the Heritage Centre. Check to avoid pre-booked groups. Dalkey Castle is open 6 days per week. Closed every Tuesday. The visitor experience is enhanced by costumed actors from Deilg Inish Theatre Company who bring the history to colourful life. An Archer will defend you, a Barber Surgeon will cure your ailments and the Cook will give you mouth-watering recipes. Dalkey Castle was built in 1390 and is quite compact in its on-street location. It has all the features of the larger Irish castles: Battlements, Arrow-looped windows, Garderobe, Murder Hole and Machicolation. Visitors will learn about the site’s history from Early Christian, through Viking, Medieval, Tudor and Victorian times to the present day. Today, it has an integral state of the art Heritage Centre with historical information in 12 languages. The Castle also houses a Writers’ Gallery which celebrates the work of great Irish writers and creative artists from Joyce to Bono and Beckett to the world-famous Maeve Binchy who lived locally. The writers are further celebrated in the ‘Maeve Binchy and Irish Writers’ Guided Walks in the town and two bespoke literary stage shows (evenings only).